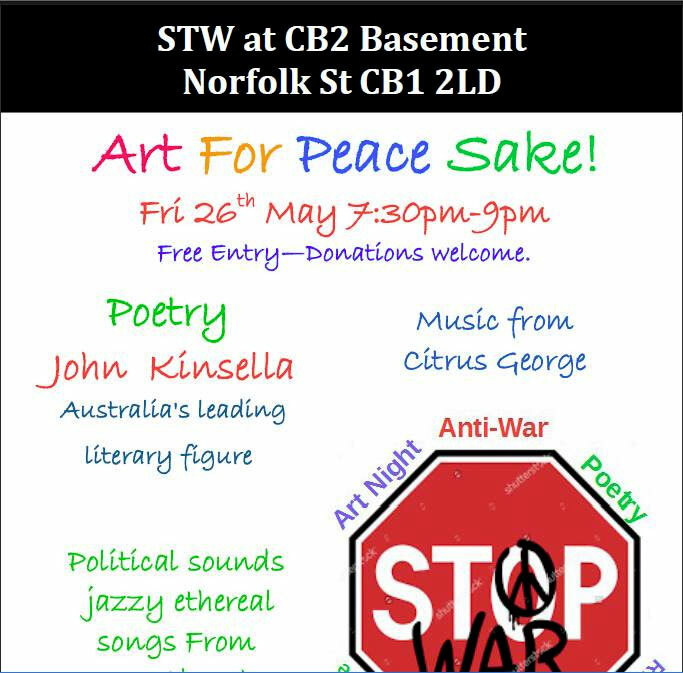 You are invited to an evening of inspirational poetry, song and music of a distinctive anti-war theme! “In Kinsella’s poetry these are lands marked by isolation and mundane violence and by a terrible transcendent beauty.” Paul Kane, World Literature Today. A newly formed group performing jazzy ethereal songs with political edge written by Colan, a wonderful artist and erstwhile vagabond from Arts Coritani in Lincolnshire, named after the local Celtic tribe who fought the Roman invaders. A mix of guitars, acoustic percussion, keyboard, voices and violin. Cambridge based singer songwriter aiming to raise issues and to donate to the community rather than make a profit. This entry was posted on 24 May, 2017 in homepage and tagged Citrus George, Colan, Frontbench, john kinsella, Stop The War. Bookmark the permalink.